Winner of Two National Book Awards! 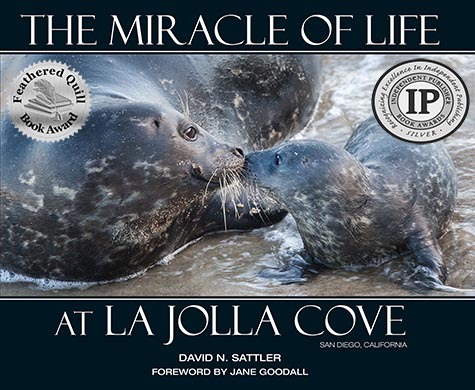 The Miracle of Life at La Jolla Cove is receiving rave reviews! “David Sattler has the eye of an artist and the voice of the poet, and the combination of these gifts with the extraordinary beauty of La Jolla Cove has resulted in this magnificent and memorable book..."
"This extraordinary collection celebrates life at La Jolla Cove—a place that attracts the young of more than one species, and so offers us a chance to work out, in one beautiful place, some of the planet’s tensions and harmonies." “As a diver, I have seen first-hand the wonders of aquatic life and the burden that we have put on our fragile ecosystem. 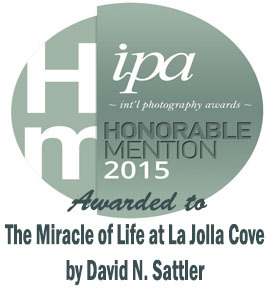 It is time to respect, protect, and celebrate our marine environment at La Jolla Cove." 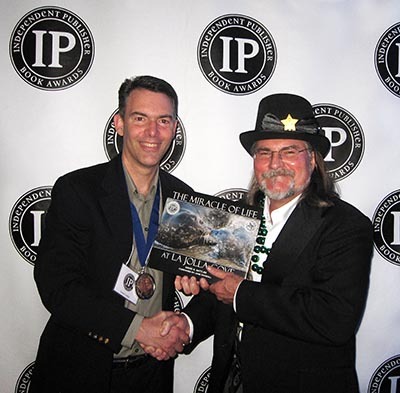 Dr. David Sattler (left) receives the Silver Award from Jim Barnes, Award Director of the Independent Publisher Book Award. Nearly 5,000 books competed in the 2016 award program, which recognizes excellence in independent publishing.